This article is about residential area in Delhi. For other uses, see Civil Lines (disambiguation). 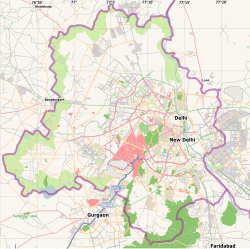 The Civil Lines is an affluent residential area and subdivision of North Delhi District in the National Capital Territory of Delhi, India. It is one of the 12 zones under the Municipal Corporation of Delhi. It was the hub of European-style hotels in the city until New Delhi came into being in 1911. The name Civil Lines is a relic of British Raj times, when the city of Delhi was organized into separate areas where the British military and civilian buildings were located. Areas, where civilians lived, were demarcated as Civil Lines. One monument of British Raj era is the Metcalfe House, Delhi. This is where the administration and governance of the Indian Empire was conducted by nineteen Governor Generals (Vice Roys) from Lord Canning to Lord Reading at their offices housed in the Old Secretariat building on the Alipore Road, and the residence of these Governor Generals was the prestigious bungalow at 1. Alipore Road which was vacated by the British Indian government in 1930 to relocate the residence for succeeding viceroys at a palatial complex on the Raisina hill in Lyutiens' Delhi known as the Vice Roy's House. The bungalow at 1. Alipore Road today houses the Indra Prastha College for Women. The Old Secretariat after 1931 housed the offices of the British Indian Army and the Post Master General and the adjoining Army Press. After independence It became the seat of Delhi's Metropolitan Council and currently houses several offices of the Central Government like the Publications Department and offices of the Delhi Administration. The Vice Roy's House today is the official residence of the Presidents of Indian Republic and is called the Rashtrapati Bhawan. The offices of the Old Secretariat at Alipore Road were also relocated in 1931 to the New Secretarial Building at Lutyens' Delhi adjoining the Vice Roy's House and is called the Central Secretariat today. One of the earliest modern hotels in Delhi was the Maidens Hotel, later Oberoi Maidens, built in 1903. It was situated in the Civil Lines, where all European-style hotels were situated and the officers of British Raj stayed. Other hotels in the area were Swiss Hotel and Hotel Cecil, run by Robert Hotz family, which also owned Wildflower Hall and Cecil Hotel in Shimla. Hotel Cecil was later demolished and today St. Xavier's School stands on the location. Raj Niwas, the official residence of the Lieutenant Governor of Delhi, the head of state of Delhi and National Capital Territory of Delhi, is located on Raj Niwas Marg in Civil Lines. A children's home run by Mother Teresa's Missionaries of Charity lies north of Qudsia Bagh in Civil Lines. Civil Lines is quite a big area consisting of various colonies and offices. One of the main colonies is Delhi Police Staff Quarters which is just behind the Civil Lines Police Station. The Indra Prastha College for Women. Mukherjee Nagar: an educational centre, mostly known for I.A.S. coachings. It has a famous Batra Cinema. Kingsway Camp: main road of G.T.B. Nagar. It is a very congested market. Estate Market. Also houses the Delhi Metro Khyber Pass Terminal and train maintenance yards. Site for an upcoming large multi storey private residential complex called La Tropicana. Gandhi Ashram, Delhi: a green open area, sometimes having a "Khadi Mela". Once Gandhi visited it. Parmanand Colony: Most of the Sikhs and Punjabis live here. Model Town: a shopping district, with many branded showrooms. Munshi Ram Colony/Dairy: a residential area adjacent to Parade Marg and Sant Nirankari Public School. Civil Lines to Connaught Place: 10 mins by Metro and 15–20 mins by Road. Civil Lines to Delhi Airport: 35–40 mins by car. Inter State Bus Terminal (ISBT) at Kashmere Gate, which provides bus service to points in other states, is a 5 min drive. Old Delhi Railway Station: 5–6 mins by Metro and 10–12 mins by Road. New Delhi Railway Station: 8–10 mins by Metro and 20–25 mins by Road. ^ a b "'Lodged' in the heart of New Delhi". Hindustan Times. 30 August 2011. ^ "Pin Code of Civil Lines Delhi". citypincode.in. Retrieved 9 March 2014. ^ "Home-Lieutenant Governor Secretariat". Retrieved 27 August 2013.